INDUSTRIAS FLORENZI, S.A. DE C.V. solving Dresses & Blouses production and contracting needs. INDUSTRIAS FLORENZI, S.A. DE C.V. 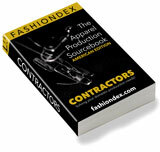 Description: Contractor of dresses, sportswear & shirts. Compare INDUSTRIAS FLORENZI, S.A. DE C.V. with all 12 listings in Dresses & Blouses.